Today, in spite of scientific and cultural advances, nations still settle their disputes with weapons, and at this juncture we seem to be alone. There seems to be nobody on the earth that dares to lift their voice against these violations of the weakest. The strongest weapons dictate the ultimate truth. However, amidst so many world problems, suffering and trouble, a ray of light has appeared, sublime hope for us who possess noble wishes and desires. Investigators and scientists travel to the most remote places on earth searching for man’s origin. Interestingly, in these troubled times when our homeland faces a permanent threat of war, a single voice rises to declare that Ecuador is the origin of the ancient Kingdom of the Kitus: the two parents. It was, for thousands of years, the cultural center of the earth and from this center, culture spread throughout the settlements of the Americas and the entire World. It gives us pleasure to present to fellow Ecuadorians the famous Argentinean investigator Juan Móricz, and as a result of his investigations, he has made one of the largest contributions ever concerning man’s prehistory. Sr. Moricz’ investigations have been conducted in different countries of the Americas and the world, and finally they have culminated successfully in 1965, here in Ecuador. 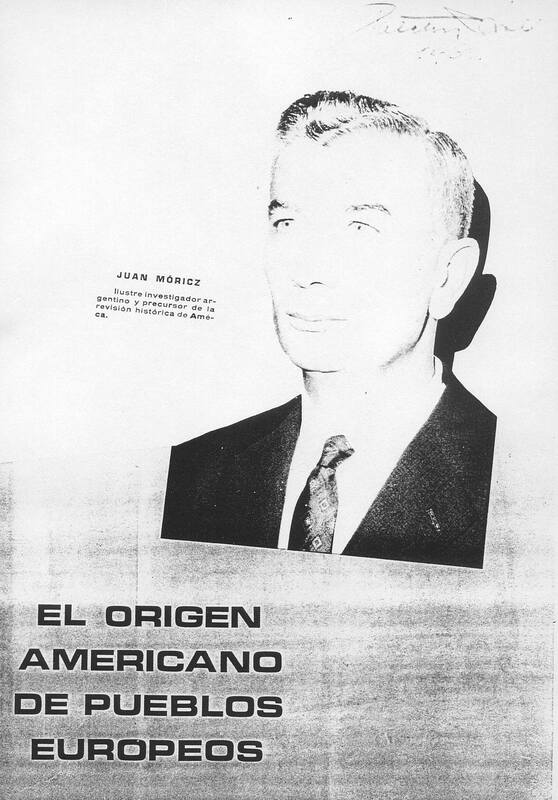 The Argentinean investigator Juan Moricz’ extraordinary discoveries have worldwide repercussions. These discoveries are currently changing our understanding in scientific centers all over the world for they are fundamentally revolutionizing our concepts of prehistory. For this reason, it has become necessary to review and revise all our knowledge of history, philosophy, religion, etc. Writing this introduction to the presentation of the study of “The American Origin of European Settlements”, by the famous Argentinean investigator Juan Móricz, makes us proud. We know that with his work, Ecuador gains a weapon much more powerful that any atomic or hydrogen bomb or any other type of weapon, and much nobler. All this due to Sr. Moricz’ discoveries which elevate our country to a high level among the nations of the Americas and all of the world. The exclusion of the American continent from our current view of ancient migrations and settlements, is the keystone to the distortion of our current understanding of prehistory. The complex problems of our understanding of the origin of prehistoric settlements and cultural migrations cannot be resolved when excluding the American continent from the picture. From our global perspective we can see that prehistoric settlements migrated, settled, diffused, colonized and eventually filled the globe as we find it today. Today our current studies and understanding of prehistory suffer from chronic failure of the “global vision” of original settlements, how they migrated and formed around the entire planet. The predominant confusion is even increased in the niche scientific disciplines where, in each, discoveries are made and announced regularly. Today, the successful archaeologist will have discovered one or more cultures. And in this successful career, the archaeologist seeks pots, vessels and cooking implements; he studies hardness, color, engraving, printing, etc. They seek to place their discovery in context. They attempt to understand the discovery in relationship to other cultures already classified. Accordingly, we have ended up this way documenting hundreds of cultures in relatively small areas. However, no proper global investigation has really ever taken place. Nobody has yet ever taken all of the small pieces of the puzzle and put them together into a great whole. Linguistic investigations are not much better. We have classified on only a part of the American continent, 396 different languages, arbitrarily divided in groups and subgroups, creating a type of linguistic map. There are still many remote, little-studied regions in the world today such as the Amazon jungle where such a profusión of different languages are spoken in such a small area that it seems like there is a different language spoken behind every tree. About the supposed arrival of mankind to the American continent, such a surprising uniformity exists that accepts the “theories” of migrations through the Bering Strait. Cultural Unit The American continent exhibits a wonderful Cultural Unit that extends to Polynesian, Melanesia, and Micronesia. Further on and below the equator. This Unit continues on to India and Lower Mesopotamia, as well as to Central Europe and the Iberian Peninsula. In this line that follows the “path of the Sun”, mankind recorded his history, and in the North, as in the South, the large cultural centers of antiquity began to diminish in size. The extraordinary knowledge they possessed of the four basic elements: earth, water, air and fire, is reflected in that only in the American continent are the respective temples erected, confirming the Cultural Unit of the prehistoric settlements of the continent. Two of the temples are in the Southern hemisphere and two in the Northern hemisphere. Having knowledge of marine currents and trade winds along with having the best materials for sailing such as balsa craft, they made regular transoceanic trips a common feat in spite of the time that was required. The ancient American settlements have a rich marine history that has been recorded in their oral traditions. Recently, long journeys by balsa raft have been conducted on the coasts of the Pacific, from Tumbez, Guayaquil to Panama and Mexico and they were able to carry loads of a hundred tons and more. Great capacity for long transoceanic trips has now been demonstrated in modern times. These same ancient settlements have never given us reason to think that, in order to arrive in the Americas, it was necessary to cross the ice or land connection of the Bering Strait. If they had crossed the Strait, there would be far more evidence of it in their traditions and legends. Their ancient transoceanic voyages are quite worthy of our admiration. Even today, these trips are not easy for well-equipped expeditions. In the cultural complex of our planet, it is most important to understand and restore the American continent to the ancient role it played in the migrations of settlements which has brought the world to where it is today. The high crests of the Andes Mountains reveal the remains of an extraordinary culture that, because of their location and their cultivated fields situated in practically inaccessible areas today, there is much evidence that a remarkable civilization survived the unfortunate days of the universal flood, in the cities and strongholds that crown the high summits of the Andes Mountains. In many other places on the earth, clusters of humans also survived the great flood. But the vast majority of survivors had their asylum on the American continent. Many of these survivors later migrated to other parts of the world. ideographic and cuneiform type of writing and also were taught about human history. Their origins are currently unknown and therefore, are attributed to the great Eastern deserts where medieval documents suggest. The settlement of Sumer had its origin in South America. The American migrants arrived in Lower Mesopotamia by way of oceanic navigation. 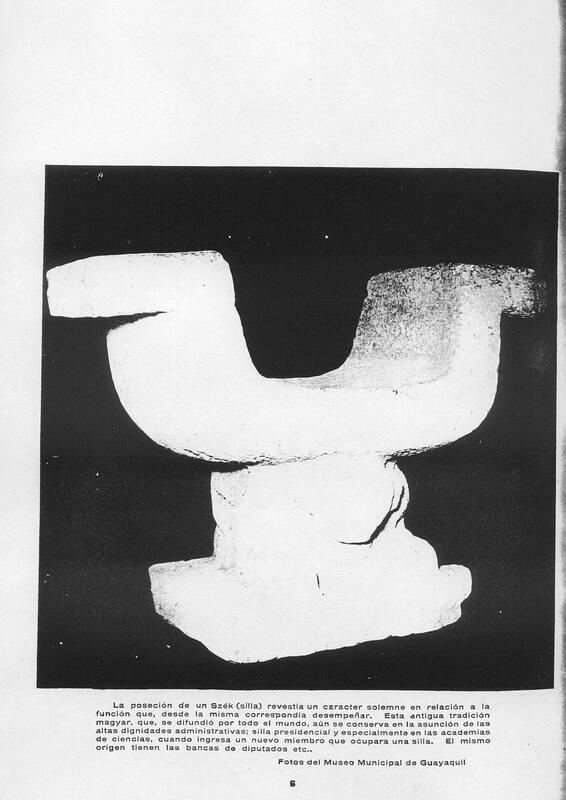 In the Ecuadorian Provinces of Azuay, Canar and Loja, evidence of Mesopotamian roots can be found in artifact designs and in place names such as Sumer, Zumer, Shumir, Sumir and Zhumir. In northern Peru, in the Department of Libertad, a city exists in ruins, covered in desert sand; it is Chan Chan. It covers an approximate area of 20 square kilometers. In spite of its antiquity and erosion, as well as damage caused by looters, the old city with its water channels and wall decorations remains, giving us an example of advanced urban development that many times you won’t even find in our own modern cities. Chan Chan and the culture that prevailed there, are Sumerian. Their extraordinary ornamental wealth, the ceramics, the embossed gold and jewels, the sophisticated burials, the print stamps and paintings, the urban development of the city and their concept of life, are all faithfully reflected in Lower Mesopotamia. In India, Lower Mesopotamia, Asia and Europe, there are many towns and settlements that have their origin in South America, from where some people migrated many millennia ago, distancing themselves from their linguistic and racial roots. However, in their new surroundings, they preserved their ancestral language and American customs. KIT = two and US = parents. In Magyar, this is actually spelled “Két – ós”. One of the largest cities in Ecuador, Guayaquil, contains in its name, a beautiful and significant memory. Its correct etymology is, according to its ancient name, Uaya: U = “old” or “ancestral”, and AYA = mother, in ancient Magyar. Therefore, its meaning is actually: “ancestral mother” or “ancient parent”. In Magyar this would be written as: “o – anya”. Ancient South American place names and artifact symbols are still found among the Magyars. This is especially obvious in regions that have been less affected by modern civilization in places like Bolivia, Chile, Peru, Ecuador, Colombia, Venezuela, Mexico, etc. In fact, this is the case from Ushuaia up to the Bering Strait. The celebrated captain Quisquis, who valiantly fought against the Spanish conquest, in spite of the phonetic distortion, had the clearly Magyar name of: quis = kis = “small” or “boy”. In Magyar, this is correctly spelled “Kis – Kis”. The name of the capital of the Incan empire, Cusco or Ccosco, is related to a settlement in Veszprem, Hungary. The town’s name is: Usko or Osko and means: us = os = the ancient name of “cu” = “Ko” = rock / stone – or – “ancestral stone”. Even in today’s Ecuador, there are some indigenous settlements that still speak the old Magyar language. Among them are the Colorado Indians of Santo Domingo. This settlement, in spite of being near the highway that connects the city of Quito with Guayaquil, has maintained their traditions and their ancient language intact. Also the Cayapas Indians that live on the riverbanks of the Santiago, Cayapas and Onzole Rivers maintain their old Magyar language, as well as groups that live far from civilization in the Amazon jungle regions on the east side of the Andes Mountains. 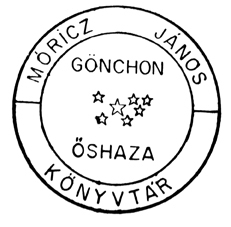 The understanding of the ancient Magyar language that is still spoken in remote South American groups and tribes is much more easily recognized by people who have been exposed to this language in certain more remote Hungarian regions that still use the vowel “U” instead of “O” and the “I” instead of “E”, etc. Ancient place names and South American artifact symbols are found throughout all of India, Lower Mesopotamia and especially in Hungary. These place names and symbols were diffused throughout these regions due to the ancient transoceanic migrations from South America, exactly as occurred with the Spanish Conquest throughout all of Latin America in more recent times. There has always been a large Magyar nucleus in India that has maintained permanent contact with the American continent as found in ancient writings such as the Rig Veda, the Puruanas, the Bhagavad Gita and others. These Magyar clusters were commonly known as white Huns or Kunos, Heftalitas, Sakas, Kmers, etc. Once again, in the 8th century, a large part of India became the “White Hun Kingdom”. For this reason, researchers of the ancient Magyars focused their attention on India where they spent their greatest energy. However, the researchers have not paid much attention to the origin of this region and have therefore been mystified by the seeming appearance and disappearance of certain settlements in history that left little or no evidence of their destiny. This same investigative problem has also plagued researchers of Basque history who were led back to India but who were then stumped as to any earlier origins. The Basques belong to the same racial and linguistic branch as the White Huns, which has its origins in America. In the twilight of the 8th century, a Magyar settlement, the Karas who were Cumans (Scythas), returned to India and prepared a fleet in which they planned to return to their solar motherland of the ancient Magyars. The mysterious disappearance of the Karas bothered researchers for centuries. They knew that if they could discover where the Karas went, they would then understand the origin of the ancient Magyars, for they had returned to their ancestral motherland. 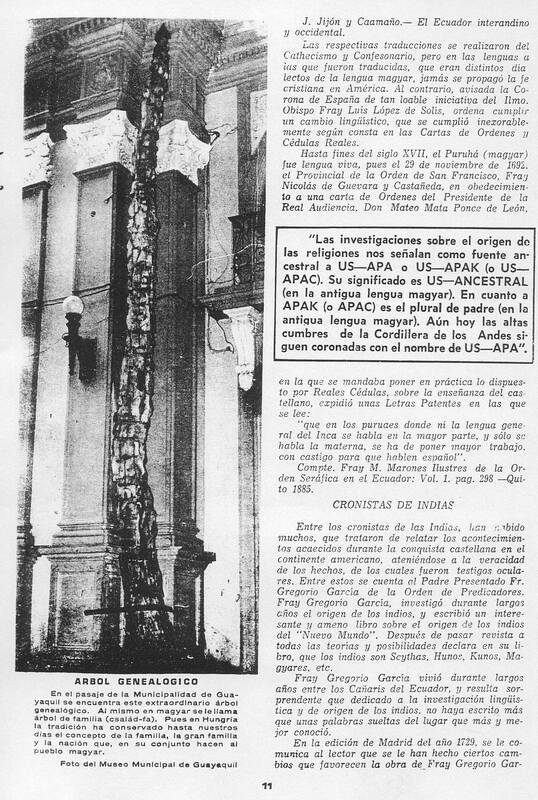 In 1965, pursuing my investigations of prehistory, I arrived in Ecuador where I discovered that one of the big problems that has concerned Ecuadorian historians and investigators, was the mysterious arrival by sea of a group of Caras (Karas) at the end of the 8th century. They arrived at Bahia de Caraquez in the Province of Manabi. One of the greatest Spanish historians and chroniclers, Juan de Velazco, documented the fact that with the arrival of the Caras, came the linguistic introduction of the vowel “O” replacing the “U” as is found in many regions of Hungary. Ancient Indian documents richly narrate, in detail, that the Cunados (Kunos) have their true ancient ancestry in America, to which they made regular trips by sea. In Todd’s Annals, on p. 250, we read, “Bappa, knowing that he left secure bases in his dynasty, returned by sea to where his ancestors had come from, Kaniska and Kanaksén, the true homeland of the Scythas Khomanos” (Kunos – Magyares). Colombia has a dense indigenous population of Kuns, that is to say the ancient inhabitants of Colombia are the Scythas Kunos. Ancient Indian documents also speak of the Mayas. They affirm that the Mayas were excellent builders and that they arrived by sea and built the ancient cities of Moenjo – Daro and Harappa and that these cities are great examples of their skills. Investigators of prehistory have not been able to make many connections because they have excluded the American continent as part of the big picture in ancient migrations. They have also excluded many ancient oral traditions and legends, and classified them as being unscientific. Many times I have looked into seemingly scientific studies and often found that they don’t have the slightest relationship to reality and what actually happened. One very sad episode eclipses the Spanish conquest of America; The Crown of Spain. The Spanish once knew the true historic reality of America and probably due to political reasons, decided to hide an important discovery made by Colombus. Once Spain had secured its domain in the New World, it proceeded to purposely erase and hide the true linguistic and historic facts of ancient migrations from the American continent. This political fact confuses our modern understanding of history, distorts reality and keeps historians in the dark. When modern Spanish researchers finally focus their investigations on the town of Iberia, which gets its name from the peninsula, they will find that it is of American origin. In spite of tightly kept secrecy today, very important documents exist in America proving the truthfulness of these facts. The respective translations of the Catechism and Confessional ceremonies were then carried out, but in the languages into which the translations were made, which were all different dialects of Magyar, the Christian faith never spread well in America. Therefore, the Crown of Spain advised Bishop Luis López de Solis to order a complete linguistic change in the New World, which was completed according to the Letters of Orders and Real Identifications. Among the chroniclers of the Indies, many tried to relate the events that occurred during the Spanish conquest of the American continent, keeping to the truth and facts of which they were eye-witnesses. Among these was Father Fray Gregorio García of the “Order of Preachers”. Brother Gregorio García investigated the origin of the Indians for many years. He wrote an interesting book called “The Origin of the Indians of the “New World”. After deeply investigating all the theories and possibilities, he declared in his book that the Indians are Scythas, Huns, Kunos, Magyars, etc. Brother Gregorio García lived for many years among the Cañaris of Ecuador. It would be surprising to think that he dedicated himself to the linguistic investigation and study of the origin of the Indians for so many years “without writing an important work of his studies. In the edition of Garcia’s book published in Madrid in 1729, the reader is informed that certain “favorable” changes have been made to the book because “certain aspects” were rather hard to believe. When studying this extraordinary work conscientiously, one gets the impression that the censorship erased some things that some people didn’t want known. In spite of the changes, it is a work worthy of being studied and I will highlight some passages that will help you to see that the Huns, Kunos and Magyars are place names of towns in America and this was very well known by Brother Gregorio García. 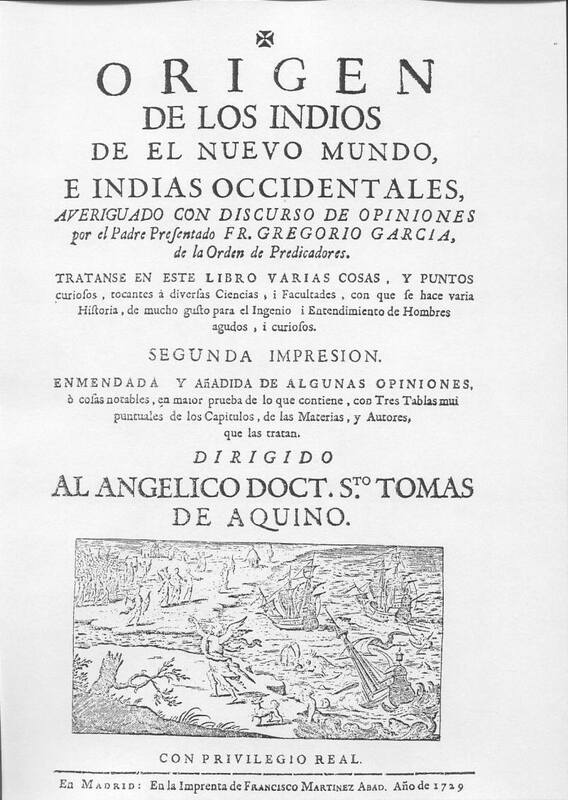 (Fray Gregorio García: Origin of The Indians of the New World, West Indies – Madrid 1729) Fourth Book – Chapter 11. Of the Scythas and the other nations descended from them that went on to populate the Western Indies to the North and East. “The first reason for this conjecture, is the incredible multitude of Huns whose name was spread in the conquered nations. They ended up propagating 103 Families from an initial 7 Families and for that reason, in Niceforo Calixto they were called: Chagano, King of Seven People and Seven Climates or Regions. They spoke Magyar: And Cedreño spoke of them as Moageres to Gorda’s brother, King of the Huns of Bosforo, who gave rise to the Kingdom. Fourth Book – Chapter 12. “The province known as Funotian has also been called Hunotian, Unchia sounds like the name of Tuchan, neighboring settlement of Quivira: The Huyrones and Soythas, mentioned by Vicente Bellovacente, no doubt are the Hurons, Indians of the five Nations of Canada whose main settlement was Carragouba: and the settlement of Unotisaston of the Neutral Indians, begins with the name of the Huns (Hunos). The generous American cultural contribution to the world that has benefited the whole earth and resulted in numerous settlements contributing to the development of our entire modern civilization, cannot end up without its just recognition for much longer. Political reasons can no longer be given as an excuse to hide the truth about a great kingdom of the past. Today, the reality of what really happened in the past, must prevail and we must come to know about the ancient migrations that forged our history and brought us to where we are today. Mankind has now elevated his sight toward the stars but should not leave his small planet in the dark, which is his home and in which for millennia there have been wars, bloodshed and fire, recorded for all of history by humanity. This history has to be known by all the settlements of the world, and the Sun that illuminates the way of the intrepid American settlements, will shine even more brightly on the day those settlements of the world see in the majestic summits of the Andes, their ancestral native home, the culture of which we all are heirs. How do you say in Magyar “estáis como cabras”? so very interesting. I really need to re-read this, and maybe even a third time to really be in understanding of it all. I am very glad to have found this. I AGREE WITH MR JUAN MORICZ, WHAT IS REALLY A MISTERY. WHAT ARE THOSE CAVE ALL AROUND THE WORLD AND TO GET THERE YOU HAVE TO GO DOWN MORE THE 200 METERS AND MORE. MY INTEREST IS IN THE HISTORY OF THE WORLD TIERRA. WHO WE ARE AND FROM WHERE WE COME FROM IN THE PAST. THE UNDER GROWN WORLD.